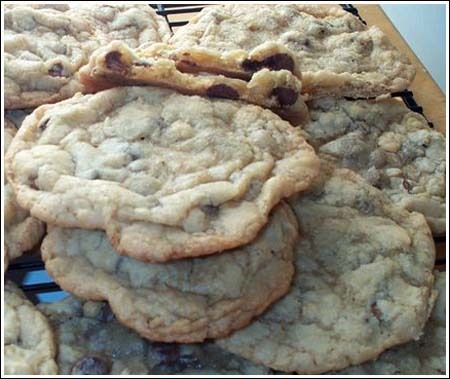 After running a few errands with Fuzz, I came home to find an email from my friend Valerie who’d gone ahead and tested another cookie from the Showdown list – Rob’s Radical Chocolate Chip Cookies. Both of us had doubts because the recipe called for milk chocolate, which is something we don’t particularly love in chocolate chip cookies. We also had look up “Baker’s Sugar” to see what it was. Turns out it is just superfine sugar. Val went ahead and used superfine sugar, but I’ll probably just buzz some sugar in the food processor. End result? Very good cookies. Based on Val’s notes (below), I’ll give them a try as well. Kay, yes. The three tablespoons of vanilla is correct. The only thing that Rob said was NOT correct was the 2 cups Baker’s sugar. It should be 1/2 cup Baker’s sugar. I am not sure why Food TV didn’t change that yet. Is the 3 Tablespoons of vanilla correct in the recipe? Seems like a lot. Other than the massive amounts of sugar, the recipe doesn’t LOOK that radical! I’m sure they taste good though. But, as established in all the “copycat” cookie making—I’m done with flat cookies!!! I have no PROBLEM with a flat cookie. Thanks for the recipe. I hope mine come out that wrinkly. Val and I have been emailing each other cookie pictures for years. One thing we’ve noticed is hers are always thinner than mine. I’m not sure if it’s the type of cookie sheet, the brand of flour, the weather or what because we both measure very carefully and sometimes weigh ingredients. It’s a mystery. Angie, thanks for posting! Now I REALLY want to make these. Can’t wait. BB, I’ll post photos as soon as the cookies are done. But back to Angie. It sounds like you had the same reservations we did about the milk chocolate. I guess some people just prefer it in chocolate chip cookies. I love milk chocolate, just not in cc cookies. Can’t wait to see some comparison photos! I love trying new cookie recipes, I may have to give these a whirl. I made the cookies too but I didn’t use the milk chocolate…I had it all ready to go into the batter but I couldn’t do it. Boy am I glad! The cookies are delicious, mine came out a little thicker than Valerie’s did but they are not your normal run of the mill chocolate chip cookie…YUM!I cant wait to see the show where these will be made on Sunday evening…I want to see the people who came up with these recipes and hear what the judges have to say about them and the winer too. Have a lovely Easter everyone! They look kind of like sharpeis. Sharpeis I want to eat.